How do you get all-round sportsmen all round the TV? Every night around the world, they're watching Thames Television. Why? Tuesday night in Zanzibar. They're watching Thames Television. What makes Noël call us Darling? 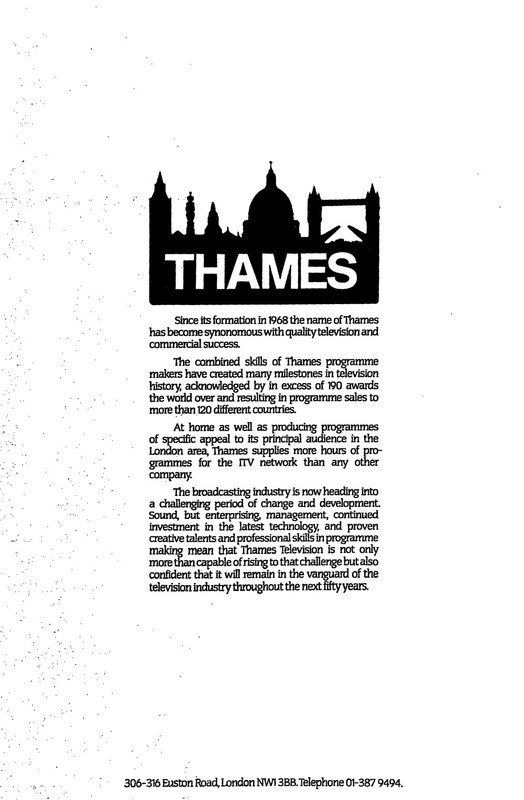 Since its formation in 1968 the name of Thames has become synonomous [sic] with quality television and commercial success. The combined skills of Thames programme makers have created many milestones in television history, acknowledged by in excess of 190 awards the world over and resulting in programme sales to more than 120 different countries. At home as well as producing programmes of specific appeal to its principal audience in the London area, Thames supplies more hours of programmes for the ITV network than any other company. The broadcasting industry is now heading into a challenging period of change and development. Sound, but enterprising, management, continued investment in the latest technology, and proven creative talents and professional skills in programme making mean that Thames Television is not only more than capable of rising to that challenge but also confident that it will remain in the vanguard of the television industry throughout the next fifty years. 306-316 Euston Road, London NW1 3BB. Telephone 01-387 9494. RELATED What makes Noël call us Darling?